View The Canal Trail in a larger map. The trail is 26 miles in length, all but the first six through a wide bend of the Potomac, known from Colonial times as the “Potomac Horseshoe.” On lands in the Horseshoe and above arose an agricultural society tied to the Potomac’s easy navigation, shallow crossings and abundant fisheries – dotted with occasional stone quarries and market towns, and later with mills and roads keyed to major shipping points along the canal and railroad. The region’s “industrial” towns, Seneca and Point of Rocks were small, located on the Potomac just above and below the Horseshoe. The white man had begun to parcel out scattered land grants in the late 17th century, but after 1722, when a treaty struck with the Iroquois removed their trails and interest to lands “west of the Blue Ridge,” settlement moved rapidly. From southern Maryland, Englishmen brought ideas of a tobacco economy and slave labor; from the north, attracted by the promises of low “quit-rents,” came Pennsylvania Germans – often in whole communities – with an agriculture that specialized in wheat, orchards and livestock. Down the same paths from the north came Scotch-Irish frontiersmen, singly or with trains of pack horses, seeking trade and adventure along the old Indian trails that led to the Carolinas. From this mix, in lower Frederick and western Montgomery counties, came a combination of attitudes, skills and ambitions that brought a unique and lasting character to the Horseshoe: tobacco plantations with outbuildings and slave cabins adjoining family farms whose distinctive artifact was the handsome German “bank barn.” Later the Chesapeake and Ohio Canal and the Baltimore and Ohio Railroad made their marks, as did the Civil War, which divided loyalties among the whites and spawned the growth of small, independent black communities in western Montgomery County. The war also stimulated a wheat boom that revived old fords and ferries and turned them into shipping and warehouse points for grain bound down the canal to Georgetown, and for lime and guano fertilizer moving upstream. Below the Monocacy River, the canal was the region’s major highway and lifeline from the 1830’s until it closed in 1924, an interlude in which the round of life along the river seemed as permanent as the seasons. Farmers plowed and cultivated bottomland fields and hauled wagonloads of grain down dusty roads to isolated shipping points at locks and ferries, where news and banter were exchanged, and an occasional romance bloomed between a local belle and a passing boatman. Even as the canal was overtaken by the railroad and trucking industries, old ways persisted, declining finally into a ribbon of abandoned buildings and rejuvenated forest tended by “oldtimers” and squatters. 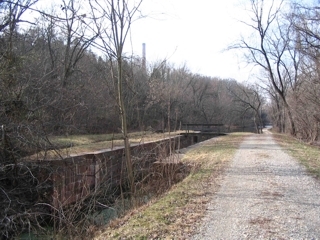 In our time, thanks to the work of Supreme Court Justice William O. Douglas and others, the old canal ditch and towpath, with their historic locks, aqueducts and much adjacent bottomland, were made into a National Historical Park in 1971 becoming a major open space and recreation corridor. From Point of Rocks through the Horseshoe to Seneca some of the canal’s most admired structures are finally receiving the stabilization and repair they urgently need. Biking the Canal: Mileage along the canal is measured from the mouth of Rock Creek in Georgetown: Point of Rocks, for example, is near Mile 48, and Seneca just below Mile 23. Most of the old mileage markers are gone, but newer ones installed by the National Park Service are pretty much intact. About every five or six miles is a “Hiker-Biker” camp with a water pump and outhouse. Parking: Since the trail is not a loop, park one car at the end in Seneca, where refreshments can be found, and drive with your bikes to the B & O Railroad Station at Point of Rocks, where there is parking in a small lot just off Route 28. Point of Rocks has two small grocery stores and a gas station which you may wish to visit. Access to the Canal towpath can be made easier by parking at the far west end of the lot. In addition, there is limited parking near the Canal towpath that can be accessed by taking either Commerce Street or Monroe Street off Route 28, and crossing the railroad tracks and wooden bridge to the parking lot. From the station walk your bicycle about three hundred yards west along the railroad tracks (toward town) to the bridge over the C & O Canal. Across the bridge on the left, a vehicular gate marks the canal towpath which you will follow to Seneca. The Baltimore and Ohio Railroad was the canal’s great competitor for the trade and commerce of the Ohio Valley. Begun the same day, July 4, 1828 by rival promoters in Baltimore and Washington, both looked to the Potomac as their route west through the mountains, in a race won by the railroad. 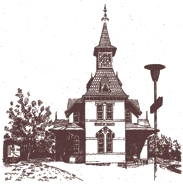 The Gothic Revival Station House with its colorful stone and brick work was built in 1875 to celebrate the railroad’s success in joining to its original line from Baltimore the new Metropolitan Branch, completed to Point of Rocks from Washington in 1873. Below Point of Rocks, locally owned boats plied back and forth to the Georgetown flour mills while others hauled stone from the Seneca quarries. An early settlement called Trammelstown stood on the heights above Route 28 until the canal and railroad arrived in the 1830’s, stimulating the growth of the present town. Point of Rocks became a market and shipping center, and today, thanks to the railroad, has several large industries and a new subdivision whose residents can commute to Washington on the Metropolitan Branch. During canal days stone quarries east of town were worked along a railroad spur, where red sandstone boated up-canal from Seneca was transferred to flatcars for shipment to points east and west, including Baltimore. B & O steam engines loaded water from a tank fed by a spring on the mountain. A few canal boat captains also lived in Point of Rocks, and old timers recall fiddle parties to celebrate the return of these men each November when the canal closed down for winter. On Saturdays farm wagons and teams lined the streets, their owners drawn to stores stocked with dry goods, general merchandise, and farm implements shipped on the railroad. Until a permanent bridge was set on the old pivot bridge abutments after 1924, wagon drivers and canallers could swing the bridge to suit them – by means of a pivot device on the central pier. The bridge could be set across the canal or turned sideways to let canal boats pass by in the space between the pier and canal bank. After crossing the bridge, study the old canal ditch for a minute. 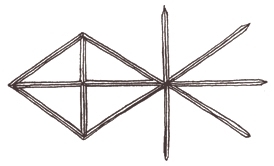 It was prism-shaped (60 feet wide at the top) and lined with clay to prevent precious water from percolating out. Since much of the clay liner remains, heavy rains still rewater the bottom of the ditch, and have created a wetland environment favorable to swamp trees such as the silver maple and green ash. These and colonies of stinging nettles grow in the old ditch all the way to Seneca. In summer, standing water is often green with duckweed – tiny flowering plants that grow in mats on the surface. Canal boats were drawn by two or three mules hooked to the boat by a long towrope and driven along the towpath by the barefoot children of the captain who, along with the mules, worked a six-hour shift or “trick.” Relief mules were kept in a cabin on the boat, which also had living quarters and a hayhouse. Unlike today, canal banks were kept clear of brush and trees, and the towpath was patrolled daily by “level walkers” who kept an eye open for the burrowings of muskrats and other trouble. 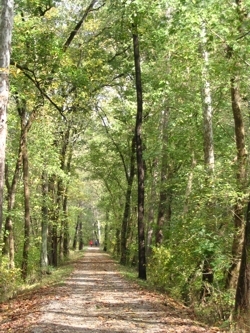 The towpath, built and repaired with local rock and top dressing, is maintained by the National Park Service, and makes a continuous 184-mile hiking and biking trail from the canal’s old terminus at Cumberland to Rock Creek in Georgetown. A boatman’s term worth learning is “berm,” a work used to describe the bank across the canal from the towpath. Calico Rocks was named for strata of conglomerate rock in which quartz and limestone cobbles are set like nuts in a fruitcake, interbedded in larger deposits of red sandstone and shale (called “redstone”) which form intermittent bluffs along the canal to Seneca. It occurs locally along the adjacent roadbed of the B & O’s Metropolitan Branch from here to below Camp Kanawha where it outcrops spectacularly. A fenced-in pond just down the towpath is Kanawha Springs. The far shore seen below Kanawha Springs is not Virginia, but a large floodplain island – once the site of an Indian village and now a State of Maryland Wildlife Refuge. Between 1699 and 1711 it was home to the Piscataway Indians, remnants of a once powerful confederation that had ruled southern Maryland before the English came. Pushed from their ancestral lands south of Washington, about 300 survivors made their way up the Potomac and built a fortified village on Heater’s Island where they farmed and hunted until drifting off to Pennsylvania. Please watch for Bald Eagle nesting activity in this area, because pairs of our increasing Eagle population are taking advantage of this great location to raise families. Modern necessity has masked its intentions behind a traditional façade, in this case a water intake that looks like an old mill. 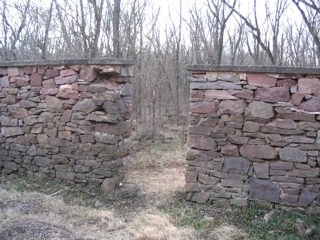 The Frederick Metropolitan Commission (the County’s water and sewer agency) has cooperated with the National Park Service by building a structure of local limestone that respects its setting. Just below the Frederick water intake, are red sandstone abutments on either side of the towpath where the Canal Company built a bridge to carry the old Carolina Road over the canal to a ford slightly downriver. Ancient Indian war and hunting paths crossed the Potomac in this area, and in the 17th century, an Iroquois path that ran across the Maryland and Virginia piedmont to the Carolinas, followed in Colonial times by the famous Carolina Road that carried settlers and commerce. By 1750 Philip Noland was operating a ferry from the Virginia side of the river where traffic was heavy enough to warrant the services of a blacksmith, wagonsmith, tailor, shoemaker, tavern and inn. After the Civil War, depredations of highwaymen and the growth of Point of Rocks caused the road to shift four miles north to its present alignment. The lower end of Noland’s Island, below the ferry, is a “gift” of the white man – built from topsoil washed down the river since colonial days. The creek was named for bands of Tuscarora Indians who camped in the area from 1712-14 during their migration to New York State from North Carolina. These were Iroquoian peoples who joined their brothers in western New York to become the Sixth Nation of the Iroquois. Along with the creek, a small settlement and post office a few miles north on Route 28 retain the name. Canal Company engineers diverted the creek under the canal through a large culvert – breached years ago by local residents seeking to drain the swampy canal bed. Level fields adjoining the berm are part of Indian Flats, owned by the Park Service but leased to farmers as a way of keeping rich soil in cultivation and maintaining the traditional scene along the canal. “Indian Flats” is a traditional name for the extensive “flats” between the canal and the railroad from Tuscarora Creek to the Monocacy River, where archeologists have documented millennia of Indian use and occupation. Over the seven-arch aqueduct, 516 feet long, canal boats glided through the watered trough, and mules clattered across the stone parapet where hikers and cyclists now walk. 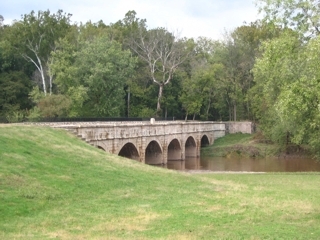 Monocacy was the longest of eleven stone aqueducts on the canal, built of massive stones quarried near the foot of Sugarloaf Mountain, and hauled to the Monocacy on a primitive railroad. A stone monument in the center commemorates the date it was first finished, in 1833, and the directors and engineers who oversaw construction. Grooves cut into the iron railings at either end were made by tow ropes which, loaded with sand and grit from the towpath, became efficient files. A major renovation of the aqueduct was begun in 1994. This very necessary project stabilized the deteriorating structure, hopefully for many future generations to enjoy. The Aqueduct was rededicated in May, 2005. Just upstream is a 700 foot viaduct supporting the tracks of the B & O’s Metropolitan Branch, which leaves the Potomac here to strike east through Montgomery County across the northern end of the Horseshoe. Completed in 1873, the rails and viaduct were raised and strengthened about 1900 to meet the load of heavier trains and engines. Just past the aqueduct, the canal opens into a wide basin abutting a small parking lot and the foundations of a former granary. Here captains loaded wheat for the Georgetown mills, or visited a small store-post office operated for many years by the local Sellman family. Several old Montgomery County roads converged at “Monocacy Post Office” as the place was known, among them Old Baltimore Road, the earliest major east-west thoroughfare in this area. Completion of the B & O’s Metropolitan Branch meant farmers around Dickerson and Barnesville could ship goods to Washington by rail in an hour and a half, compared to a day or more by canal from the Monocacy Basin. One of the largest culverts on the canal, it was repaired recently by the National Park Service. Streams larger than the Little Monocacy were generally bridged by aqueducts. Overgrown chimney ruins between the canal and river are said to mark the site of a house and mill built by Dr. Charles Boyd in the late 18th century. In the 19th century important grist mills lined the Little Monocacy several miles upstream, including Oakland Mills on the Old Baltimore Road. In the years before the C & O Canal was dug, grain and whiskey were carried down the Potomac in longboats; this, with the proximity of the Carolina and Old Baltimore roads, may explain the presence of a mill on such an isolated river bottom. The ferry, like its competitor at Noland’s three miles upstream, operated from the Virginia shore. Lock and lockhouse were built about 1831: here, when the wooden gates were in place, canal boats were raised or lowered about eight feet to overcome a gradient between this lock and the next one. 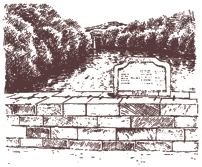 An old road ran over the hill on the berm, and another followed the berm to Monocacy basin.In the 1870’s, canal traffic was heavy enough to cause the canal company to “double-lock” Lock 27 and a few others: a cruder second lock was extended above the original to let two boats pass at a time. Rock walls of the second lock, now mostly rubble, are still in place. A canal boat’s size was limited by the size of the standard lock, which on the C & O Canal, was 100 feet long by 15 feet wide. Boats were built to squeeze through with little to spare, averaging about 90 feet long by 14.5 feet wide. Just above the lock is a concrete “waste weir” used in draining the canal. When repairs were needed above Lock 27, boards were placed in grooves at the head of the lock, and the water drained from the canal through the weir. Below the lock a mile of canal bed has been repaired and filled with water from the nearby PEPCO Plant; here, except for trees along the towpath bank, the canal looks much as it did during boating days. Compare PEPCO’s treatment of the canal with that of the Frederick Metropolitan Commission, especially the large concrete intake structure on the right. The plant began operation about 1959. A third smokestack, built in 1977 is 750 feet tall. PEPCO uses river water to condense steam that drives the plant’s turbines, and this water, much heated, is discharged into the Potomac through a concrete spillway across from the plant gate. In the 1960’s the Park Service cleared brush and trees from the canal bed from PEPCO to White’s Ferry with the idea of rewatering that section, but the plan was never implemented. Marsh plants have moved in along with a few trees, presenting a scene much like the one that greeted local farmers a few years after the canal had closed. Note the just-mentioned power plant spillway, on the right side of the canal. A number of years ago, a rather unique use was devised for that structure, which carries the heated water from the power plant back to the river, at a high rate of speed. Recreational and competitive kayak groups were allowed to create a world-class course in the spillway, which can be readily seen from the towpath. Often, kayakers can be seen practicing in the course. Occasionally, international kayaking competitions are held at this location. Marked by the parking lot and earth causeway on the berm, it is an area used mostly by fishermen. Its development will be coordinated by its owner, the Maryland-National Park and Planning Commission, with National Park Service master plans for the canal. An old road came down the hill on the berm that may have led to the little-known White’s Ford. The 10th Vermont Regiment, which patrolled the canal from White’s Ferry to the Monocacy in 1863 had a small camp here, dipping water from the locktender’s well and swapping him coffee for fresh vegetables from his garden. 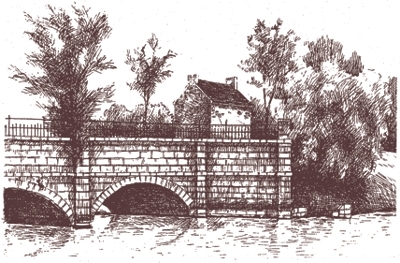 Since the canal was the only direct supply line from Washington to Point of Rocks, it had similar garrisons at other locks and aqueducts, backed by cannon and earthworks near major fords and ferries. About the time workmen were digging the canal ditch and laying stone for Wood’s Lock in the early 1830’s, a bank barn with an unusual mix of German and English features was built on the nearby Trundle-Shreeve farm. Since many of the canal masons were English, the story has persisted that the barn was built by “moonlighting” canal workmen. The magnificent silver maple near the lockhouse foundations may have been a sapling then. A little-known crossing near Wood’s Lock, it was used by Confederate troops on raids and major campaigns to and from Maryland. For the Army of Northern Virginia, much of the war’s pathos was chronicled here, from the high hopes of September, 1862, when Stonewall Jackson’s Corps waded the river to bands playing “Maryland, My Maryland,” to weary remnants of the same army retreating from a raid on Washington in July 1864, when the war had become a grim battle of attrition they could not win. Another large floodplain island close to the canal, it is still farmed. Listen for the sound of rapids – several V-shaped rock dams line the channel, probably built as fishtraps by Indians who put nets or wooden baskets at the point of the V.
The “marble” is another vein of calico rock that outcrops back of the sandstone bluffs on the berm. It was used at Benjamin Latrobe’s insistence when he rebuilt the Capitol after the British had burned it in 1814: large columns, still found in the Hall of Statuary, were carved out whole and shipped down the Potomac in longboats. In lieu of wooden fencing or barbed wire, upcounty farmers planted thorny osage orange hedges to confine their livestock. Remnants of such a hedge line a former pasture that ran up to the edge of the towpath; their green fruits (which can be found on the towpath in autumn) are about the size of softballs. The “upper” and companion ferry to Edwards Ferry (five miles below), it has connected the market towns of Poolesville and Leesburg since the late 18th century. Granary ruins on the berm, just before the towpath reaches the highway, recall the wheat boom of the 1850’s and 60’s when a pole-operated ferry was doing business. As the “action” bypassed Noland’s, Spinks, and Edwards Ferry, White’s hung on to become the last operating ferry on the Potomac – and the only crossing in the forty miles from Cabin John to Point of Rocks. Farms in the Horseshoe were far from the railroad and suffered a hard blow when the canal and its services were denied them after it closed. Paved roads were unknown, and the way to Washington with a wagon was over rutted roads that shook and jolted in summer, and mired horses and wagons up to the hubs in “mud-time.” Old River Road, which still runs from White’s Ferry to Tenallytown in the District of Columbia, was just such a road. The flood crest of June 24, 1972 is recorded on the second story of the present store. The “trunk” was really a wooden aqueduct across Broad run, built in the winter of 1856-57 to replace a two-arch culvert destroyed by a freshet on Broad Run earlier in the year. 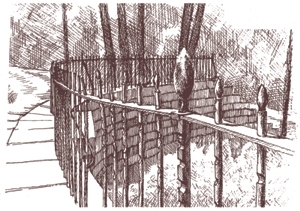 The wooden trunk, or “flume,” set on stone abutments, is the only wooden aqueduct on the canal, and an example of how the canal company adapted to worsening economic and environmental conditions. Virtually the entire canal was built in the Potomac’s floodplain, where it felt the lash of recurring floods that swept away boats and lockhouses, breached dams, and scoured the towpath. Damage to culverts and aqueducts came from heavy rains on tributaries such as Broad Run, which piled tons of water and debris against upstream walls and abutments. The “lower” ferry connecting Poolesville and River Road to nearby Leesburg was, like White’s Ferry, an important storage and shipping point for local farmers, and continued in operation until 1936. After the canal quit, enterprising farmers in this part of the Horseshoe used the ferry to haul their products to the Washington and Old Dominion Railroad at Leesburg. A whitewashed lockhouse and the ruins of a store long operated by the Jarboe family remain, recalling summer nights at the turn of the century when the little Edwards Ferry community could sometimes hear, above the chorus of crickets and katydids, the strains of a band concert in Leesburg. In the 1830’s, before the advent of the Alexandria, Loudoun and Hampshire Railroad (later the Washington and Old Dominion), farmers along Goose Creek looked to the C & O Canal as a tie to Washington area mills and markets. The Goose Creek and Little River Navigation Company was incorporated in Virginia on March 15, 1832 to canalize Goose Creek and build locks around its rapids – with the idea of running cargoes down the creek from as far as Aldie, on the Little River, and poling them across the Potomac and into the C & O Canal. Adjoining river locks (a “double lock”) were built by the C & O Canal Company as part of the project in return for a stock subscription purchased by the State of Virginia. A turning basin (on the right) connected the canal to the river lock. About 700 acres of flat alluvial fields are farmed in three-year cycles of grasses by the Summit Hall Turf Farm. Other turf farms adjoin the canal above Edwards Ferry, called into being by the demand for turf to re-sod lands cleared for metropolitan area subdivisions. Remembered by canallers as “rope harbor,” the landing is marked by a wooden bridge that crosses the canal to a small parking lot. Loads of oyster shells shipped from Herbert Bryant’s in Alexandria to Sycamore and other canal landings helped farmers “sweeten” acid soils. A 1,475 acre tract around and below Sycamore Landing, owned by the State of Maryland, part is managed as a wildlife sanctuary and part is open to public hunting on a permit basis. In it are many acres of valuable swamp and marshland. 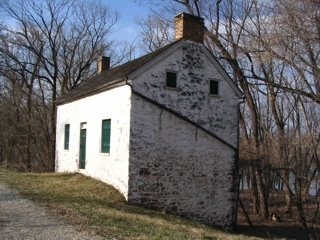 Much of the acreage was part of a 1695 grant to Richard Brightwell, a Potomac Ranger Captain who patrolled the frontier from the Potomac to Sugarloaf Mountain, and settled later at his “Hunting Quarter” with a pack of dogs and a pet bear – the first white man to take up permanent residence in the Horseshoe. Where the sandstone bluffs begin on the left was one of several quarries that adjoin the canal for the next mile, this one owned by the Federal Government and used in many 19th century construction projects, including the water supply aqueduct for Washington, DC. Across the marshy land north of the bluffs grew a settlement of free black quarrymen, some of whose descendants still live in the Seneca area. Other quarries and ruins are to be found further down the canal. Both are made of dressed Seneca “redstone,” as were all thelocks, lockhouses and culverts between Seneca and Point of Rocks. Riley’s is the only case on the canal where a lock directly abuts an aqueduct. In boating times, Seneca was a bustling industrial community where dozens of men worked long hours at the stone mill and quarries, in a grist mill that stood on the creek at River Road, and at warehouses set along a second basin where the present parking lot is. Familiar sounds were the ring of hammers on steel “stone-drills,” and shouts of “Hey lock! Aw Lock!” by boatmen approaching the lock. Slanting across the Potomac to Virginia at Violet’s Lock, about a half mile below the Aqueduct, are the remains of a rock dam (Dam 2) built from quarry waste by the C & O Canal Company to impound water that is still fed into an 18-mile section of restored canal. Dam 3, a masonry dam built across the Potomac above Harpers Ferry, supplied the canal with water from there to Violet’s Lock. Below Dam 2 is a mile of rapids, the Seneca “breaks,” formed at a zone where the rock strata have been fractured or “faulted” – marking the end of the Seneca sandstone beds and of the Potomac Horseshoe. To see the old hand drawn Trail Guide site maps for The Canal Trail (now out of date), please go here.